She was a high school art teacher in London before moving to San Francisco four years ago to study new media at the Academy of Art. Carly Lane Plaskett flourished in the “digital meets old school design” program. For a class in typography, she was challenged to design her own font. Since she lived near Fillmore Street, she decided to evoke the neighborhood’s jazz era. “I wanted something local to inspire me,” she says. “All through school I’d worked at Harry’s on Fillmore.” She studied mid-century typefaces, with their thin and thick letters, as she created her own Fillmore face. Once she’d created the font, she had to demonstrate its use. 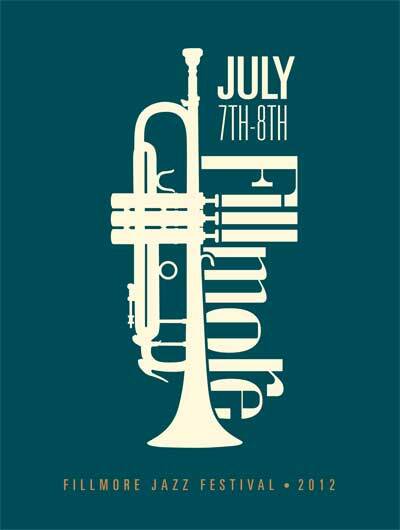 Last year’s Fillmore Jazz Festival had just come and gone, so she imagined what the next poster might look like, and how the design would work on postcards and street banners. She got an “A” on the project and graduated to a job at Sparkart, an agency in Oakland. And when she emailed a copy of her Fillmore Jazz Festival project to the festival’s organizers, they promptly suggested it be featured on the poster for this year’s festival. “It’s really exciting to see my design all over,” she says. She was especially flattered when the poster was reproduced in chalk on the blackboard at Kiehl’s.